BAM! The fish hit. I set the hook, and it didn't budge... A few head shakes and she started taking drag. "Hmmm," I though "maybe this fish is a little bit bigger than the other ones..." It was, but unfortunately I had broken one of the cardinal rules of bridge fishing... Never go fishing on a bridge without a drop net! Hey, guess what!?! I finally made it to the beach this past week. I had off of work on Tuesday and Wednesday, and the weather forecast actually looked good. So I decided to go for it. My first trip this year! Tuesday night I fished for stripers. 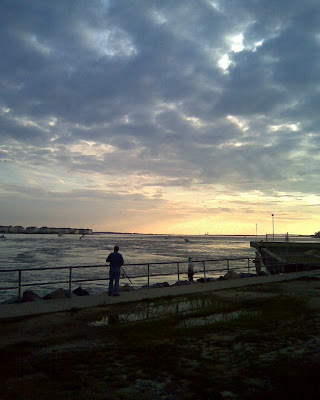 I started out at Indian River Inlet for the flood tide, and then moved further south to Ocean City, MD for the ebb. Nothing was going on fish-wise at Indian River while I was there, but I was able to meet up with a couple of friends (Peter and Bill) that I know from fishing the area. We fished and chatted, but ultimately didn't do much catching. 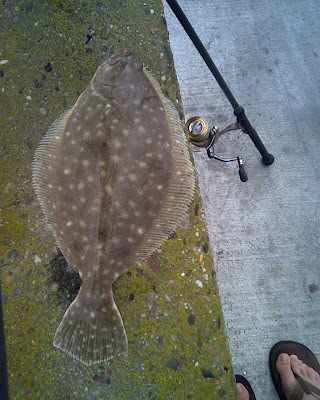 Wednesday found me seeking out flounder around Ocean City. The first spot I tried was a bust, but the second spot turned out to be a real producer... and eventually led to the predicament outlined in the introductory paragraphs above. 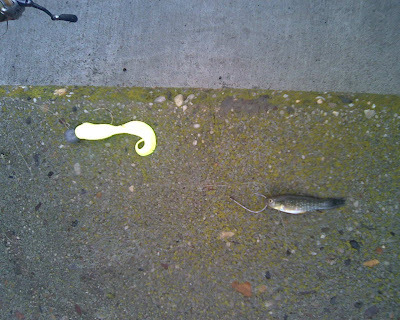 I fished with a tandem rig consisting of a Berkley gulp mullet paired with a live mud minnow. I'm not sure how many flounder I landed, but I had a fish on just about every cast for an hour, at which point I ran out of bait. After returning from the tackle shop, I left my bridge net in my car--pure laziness--and a stupid mistake... 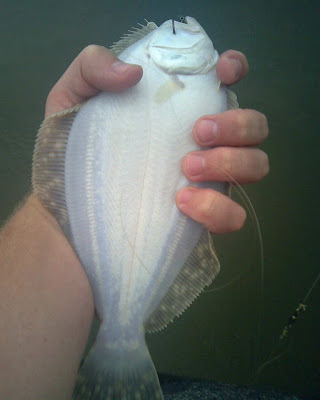 Most of the flounder I had been catching were small, but unfortunately we all know the outcome. Sometimes in life we need to learn lessons more than once. And this past weekend I did it again, ha ha! Wednesday night, I was fortunate enough to get out on the water with my good friends Anthony, Angelo, and Skip Maguire, who runs Skip's Charter Service in Ocean City. We took Skip's boat and drifted live spot around the inlet's south jetty. We had a great time, and it was just as much fun catching up with friends as it was fishing. All in all, I landed 3 stripers and had numerous other hits, and misses. Both other guys landed some bass as well. Skip has pictures from the trip on his camera...hopefully I'll be able to get a couple from him and post them here for you. After we came off the boat, I hit another local spot in Ocean City and picked up a couple short stripers on the end of the incoming tide. Then I headed up to the bridge where I sacrificed a small school of plastic shads to the bluefish who willingly ravaged my baits until my energy and attention span had officially waned... at which point I retired to Skip's place and crashed on his couch. Thursday morning, I awoke, blitzed the Fisher's Popcorn stand, hopped in the civic and headed back home to PA. It was a great couple of days at the beach. I finally got to soak in the familiar sights and sounds of the surf... Spent some great time on the jetty and the bridge... Got to see and chat with some good old friends... and I caught some pretty decent fish as well. Can't wait to do it again. Thanks for reading!